Innovative equipment producers have announced their participation at ProSweets Cologne, January 27-30. We selected some of the most interesting equipment showcased at the international supplier fair for the sweets and snacks industry. 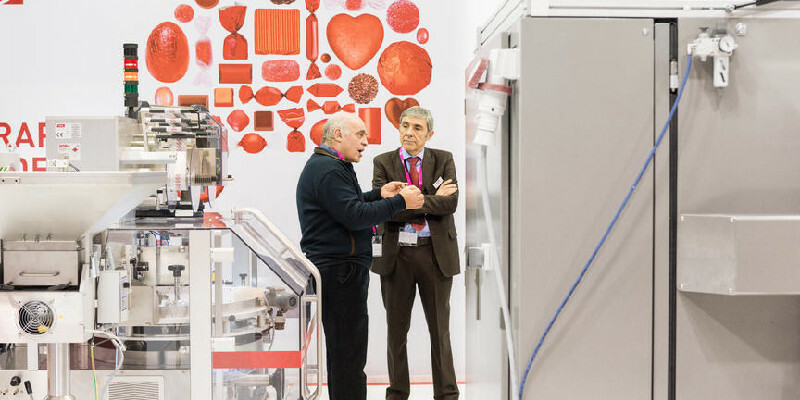 TOMRA Food is showcasing new sweets sorting systems for gummies and delicate confectionery products at ProSweets 2019, for the first time. TOMRA systems help food manufacturers ensure that their end products always meet the highest quality standards by reliably and efficiently removing defective articles and foreign materials. TOMRA uses advanced technology for the reliable sorting of sweets. Product color and structure is checked by laser scanners. In addition, the scanners identify contaminated products or foreign objects that are not visible to the naked eye. When augmented by an Advanced Foreign Material Detector (AFMD), sorting can be supplemented to include product-specific properties. Additionally, Schubert is presenting a lightline Flowpacker equipped with its latest heat sealing technology, with which heat-sensitive products such as chocolate can be packaged gently whilst still maintaining the high level of performance. The Flowpacker is part of the new lightline machine series with which Schubert is offering its customers three attractively priced, preconfigured machines to take on standard packaging tasks. Schubert Packaging Systems will be presenting its comprehensive portfolio of engineering solutions and services. VEMAG Maschinenbau GmbH will exhibit its portfolio of equipment for shaping and portioning fine doughs, pastes and pumpable mixes. The company based in Verden Germany will use live demonstrations to present three custom solutions, providing inspiration for individual machine configurations tailored to user requirements. The machines at the fair will include the flexible portioner Robot 500, featuring cutting device ASV811 and a rolling unit for shaping and portioning, a HP20E featuring portioner MMP223, plus a HP20HT featuring a 20-up filling flow divider for parallel output of various types of mixes. VEMAG machines ensure reliable portioning and outstanding shaping into bars, balls, blocks or other shapes. A wide variety of modular attachments ensure that the food portioners can be used flexibly to cope with seasonal demands and at a high output to process a plethora of products. AZO is preparing to exhibit its operator-guided manual weighing center ManDos, which is ideal for micro quantities such as flavorings, baking agents, emulsifiers, dyes and other ingredients that cannot be fully automated in a profitable manner owing to their consistency (physical properties) or production need (quantity and frequency). However, it is these micro quantities in particular that have a crucial impact on the recipe, meaning that proper control and documentation are essential during their addition to the manufacturing process. ManDos can be used as a stand-alone system, but can also be expanded to a comprehensive, networked batch production system with host interface. The logical user guidance provides the best support for the operator and minimizes wasted batches. The raw material identification using barcode and the documentation of all work steps and weighing results ensures traceability of every batch at any time. The system has its own master data management (order and recipe management as well as item and stores management). Technology group GEA will offer customers and interested parties insights into its efficient industrial solutions and machine technology for the confectionery, snack and bakery industries at ProSweets. A look inside the machines, discussions with technology experts and live machine demonstrations with a focus on the unique features of GEA plant technology are planned. Product highlights include the recently launched GEA SmartPacker CX250-S, a vertical form-fill-seal packaging system (VFFS) for high-speed packing of confectionery, snacks and nuts and the GEA Aquarius TwistWrapper for lollipops with its unique OverlapSeal option. This easy to open option provides unique added value to lollipop packaging. GEA will also highlight its innovative process and technology solutions for the bakery segment by showcasing a range of bakery products produced by GEA equipment onsite at its ProSweets booth. GEA combines its proprietary technologies and full line integration capabilities to provide turnkey systems for a wide range of products from a single source.